This giveaway is now closed. Thank you! Congratulations commenters number 1 and 2. I have only recently been introduced to Sister Schubert's Homemade Rolls, and I am in love with them! Last night, I served soft pretzel rolls. Oh, they were good! My son begged me to get more. They have a slightly crispy outside, and a warm, soft inside that has a hearty, unique flavor. A few nights ago, I served the Mini Baguettes. They have a golden crust and a soft, airy center. I loved having my own baguette to myself! They taste like they came straight from the bakery! Not only do these breads taste homemade, they are also convenient and quick. They are sold in the frozen food section of select grocery stores for less than $4 per package. Plus, they are ready to serve in 7-9 minutes! You can check to see if they are available in your aread by clicking here. There are also great recipes on the Sister Schubert's website. 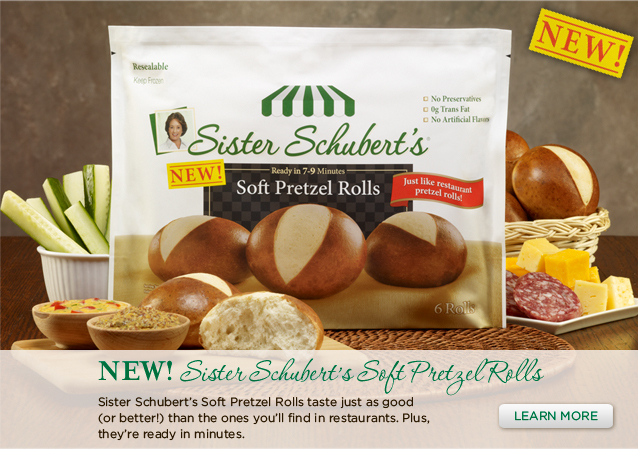 How would you like to win a coupon for a FREE Sister Schubert's product? Great! Just leave a comment on this post telling me which of these two products you would most like to try. If you would like an extra entry, tweet this giveaway and leave a second comment with your link. Easy! Please make sure I have your email address. Deadline for entry is 11:59 PM CST on December 26, 2011. Two winners will be randomly selected. U. S. only, please. I was one of the bloggers selected by T. Marzetti Company and Family Review Network to host a Sister Schubert’s Homemade Rolls giveaway. They provided me with product to test myself as well as prizes for my readers. However, my opinions are entirely my own, and I have not been paid to publish positive comments. I'd love to try the pretzel rolls. I would like to try the soft pretzel rolls! Hi, I would like to try the soft pretzel rolls. would love to try the soft pretzel rolls, but I am sure I would love the baguettes as well - first "met" pretzel rolls in the form of burger buns in Chicago, and immediately determined them a must have, so great to know they are available in the freezer at the grocery! I would love to try the Mini Baguettes! For me it would be the Parker house rolls and the cinnamon rolls! !